This year’s full moon closest to the autumnal equinox rises in all its giant, gorgeous glory on October 5, but its waxing and waning put on a good show too. Each year as summer in the Northern Hemisphere slowly slips into autumn, we have the September and October full moons to shine their luminous light on the change of seasons. When the September full moon occurs closer to the autumnal equinox, which fell on September 22 this year, it’s called the Harvest Moon. But if the October full moon is closer to the date, she takes the title. All full moons are special, but the Harvest Moon has some unique features that make this month’s moon a marvelous must-see. 1. This year’s Harvest Moon will be officially full at 2:40 p.m. Eastern Daylight Time on October 5 – this is when it is directly opposite of the sun. But will appear full for a day or two before and after. 2. In the 80 years between 1970 and 2050, the October full moon will only claim the Harvest Moon title in 18 of those years altogether. The last time was in 2009, and the next time will be in 2020. According to Space.com, October Harvest Moons come every three years on average, although as many as eight years can elapse between them. 3. Next year, we’ll be back to the more usual schedule, with the Harvest Moon occurring on September 24, a mere two days after the 2018 autumnal equinox. 4. 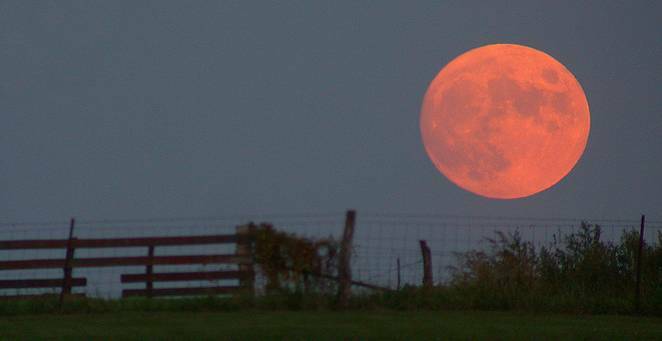 Harvest moons can happen as early as September 8 or as late as October 7, making this year’s relatively late. 5. Sometimes the full moon happens on the equinox itself, the Harvest Moon last perfectly coincided with the autumnal equinox in 2010, and will do so again in 2029. 6. According to early Native American tradition, the calendar was marked by cycles of the moon and thus, each one has a seasonal significance and name. The October moon has been variously known as the Full Hunter’s Moon, the Travel Moon, and the Dying Moon. 7. The autumnal equinox full moon is called the Harvest Moon because its unique features traditionally helped farmers. The term dates back to at least the 18th century, according to the OED. 8. During the rest of the year, the moon rises up to a full 73 minutes later each successive day of its cycle; but the Harvest Moon rises in as little as 23 minutes later each day. This happens because during this time of year, the moon’s orbit is more nearly parallel to the horizon and thus its relationship to the eastern horizon does not change much from day to day. 9. While all full moons rise at sunset, the fact that the Harvest Moon has a shorter rising lag on successive days means that we get what appears to be a full moon rising near sunset for more days than usual; this gave farmers a “sunset extension” of sorts, which went to good use during the very busy time of harvest. 10. The sunset-moonrise concurrence also simply makes for a spectacular spectacle, which we are treated to for several days. Low-hanging moons at sunset are reddened by clouds and dust, giving them that surreal “giant floating pumpkin” effect that so perfectly ushers in the fall. 11. And about the giant part; the Harvest Moon is like the moon poster child for the so-called “moon illusion,” in which a horizon-hovering moon appears to be gigantic. The moon actually doesn’t change size, it’s just a trick of the eye – one theory suggests that in relation to terrestrial objects the moon appears much larger than when it’s floating in the vast heavens. Though, it’s a bit more complicated than that, as you can see in the video below. That my troubles are soon to begin. The thing about this week is the danger of losing yourself in order to “look good,” “care take,” or “be there,” for everybody else. The challenge is to find the balance between, and honor both your inner personal needs and feelings while also showing up for others. This mantra does not imply that whatever urge arises needs to be acted on. The important thing is that the feeling is felt, recognized, and used for increased self knowledge and inner growth. Followed to its source, each feeling holds important information about who we are, what we need, and where to go, and why we are here….. tune in and check it out….. happy holidays! DISCOVER – The meaning of the sabian symbol at the degree of te New Moon – Indian Chief Claims Power from the Assembled Mass. PREPARE – for the Mahavidya on duty and what she has in store fort he Matrix, Just wait to see the affect of her Kiss of Justice. And how this mission we wise owls are on leeds t the tree of life. New Moon is Saturday, November 22 at 5:32 AM Mountain Standard Time (MST). This is a reset. The time can be confusing and you may not have a great grip on what your reality is. Take some time this day to go back to basics and review the last few weeks. What is working, what is not working, what did you intend to do but have not done yet, what feels incomplete or completely disorganized, what are you afraid of, what needs to end and what do you want to begin. Keep track of your review either by sharing with another or writing it down. Spend some time in prayer and intention setting based on what comes up. It is a good time to focus. Welcome and claim Sagittarius’ optimism and broadening perspective supporting us in questioning our beliefs that hold us small. We move beyond the previous Sun cycle of Scorpio’s use of powerful, intense energy to release our hidden, unconscious wound patterns that hold us back in fear (phew, we did our work and made it through that one), and now we step into the expansive, enthusiastic energy of mutable, fire sign Sagittarius. Mutable signs (Gemini, Virgo, Sag, Pisces) bring mental adaptability while spiraling shift and variety into the equation. Mutables love to learn. We welcome in this refreshing point of view after Scorpio’s fixed, obsessive and psychological perspective. We trade Scorpio’s power conscious ruler, Pluto, for the jovial, generous, inclusive qualities of Jupiter now passing through Leo for the next year. When everything in your life lines up and moves with ease and grace and you feel you are in the right place at the right time, Jupiter is working in your life. Sagittarius with Jupiter’s influence molds our personal ethics-what we base right action on and also our belief systems-the lens and filters we view all our experience through. Sagittarius’ symbol of the centaur aiming his arrow far out into the heavens depicts the reach for truth, knowledge, and consciousness that Sag brings to the zodiac. Sagittarius’ true purpose takes us further-beyond knowledge-to find meaning and understanding of the human experience rising above the mundane and seeing the big picture of our purpose in taking on a physical life. Keep in mind as we approach the shift of energy from Scorpio to Sagittarius that Saturn has been in Scorpio since October 2012 and our lessons in that time frame have been about digging deep and releasing old patterns, and we are now on the edge of Saturn changing signs at the end of December and moving into two plus years of Sagittarius – a much more optimistic, active, and consciousness expanding sign. This Sun sign shift from Scorpio to Sagittarius this Saturday (coupled with New Moon) is a prelude to that more major move by Saturn on December 23. Any New Moon allows us to reset our sights, realign and adjust to the present circumstances. Who am I now?! And now we have the maximized boost of the Sun changing signs coupled with New Moon at 0º. It’s everything we need to let the past fall away, forgive our selves and others, and set strong intentions for the end of the year. All the shifts of the Sun into a new sign since Fall Equinox have been paired with a New Moon at 0º and the pattern continues until March 2015. The image of Botticelli’s Birth of Venus comes to mind as she steps from the primordial soup, the ocean, onto land – that dynamic edge of leaving something behind and beginning anew. Approach these natural occurrences and alignments with awareness, gratitude and awe and welcome the natural order unfolding and providing for us. Ceres, goddess of agriculture, is in Sagittarius; Venus entered Sagittarius on the 16th, and Mercury enters on the 27th. Sagittarius and its natural 9th house of the zodiac relate to ‘higher mind’ meaning philosophy, law, religion (not spirituality, that’s Pisces domain), higher education, publishing, foreign travel and foreigners. Watch these influences bring you a broader vision when you explore new territories in their domain. Neptune in her own sign Pisces is gaining strength, as she has just turned direct on the 16th after five months retrograde. Squaring the Sun and Moon, Neptune opens the temple doors and invites us to open to the broadest possible ‘horizons’ ~ our own divine essence. Can we clear off the cobwebs of guilt, sin and unworthiness laid down in fear and trade up to a vision where we are infinitely loved and capable of bringing God joy in our every decision and action? We may feel the tug between these two poles as we learn to make choices this month from a new perspective. No air signs in this New Moon chart could lead some to feel anxiety, threatened by the chaos of our times, defensive and unable to find real focus or ability to sway with what arises. What we do have is a preponderance of fire signs so energy and enthusiasm will be abundant, and we certainly can put that to good use as the year draws to a close at Solstice. All three fire signs, Aries, Leo, Sagittarius, are inhabited and in positive relationship and boosting our creativity, inspiration and optimism. Let Jupiter in magnanimous Leo along with New Moon in Sagittarius and unpredictable, norm-busting Uranus in Aries light a self-confident glow in your belly and radiate your creative warmth to all areas of your life. Oracle Report – NEW MOON IN SAGITTARIUS. 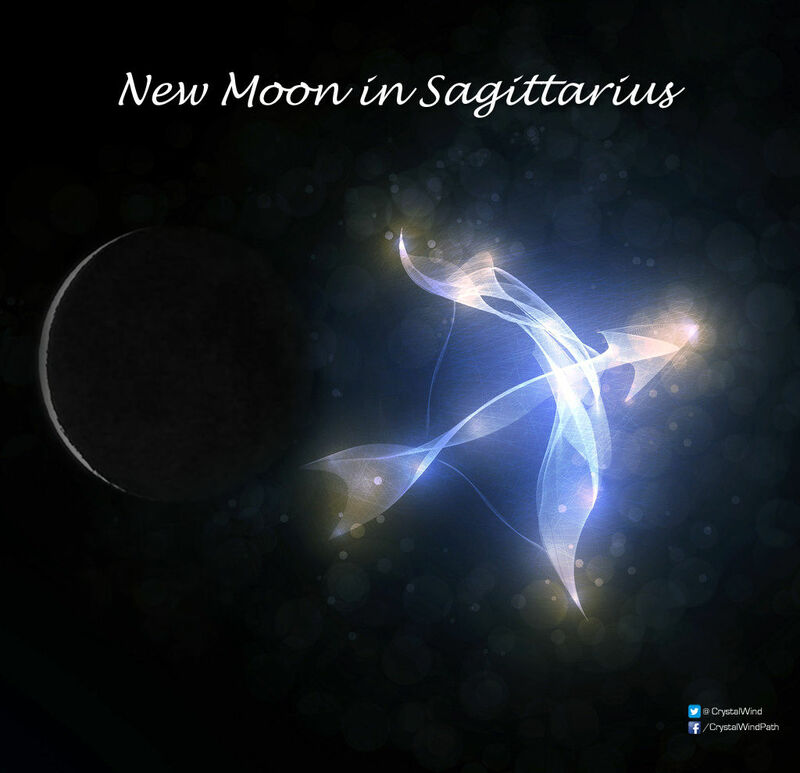 AUDIO RECORDING – Laura and Andrew discuss the energy of the upcoming new moon phase in Sagittarius. A full moon in Taurus is steeped with loving depth and potential as this sensual ball of light opposes the sun in Scorpio, which is still forming a new phase conjunction to Venus. This full moon is also making wonderfully supportive angles to Mars and is forming a closing conjunction to Pluto in Capricorn. This suggests a karmic theme with certain others is coming full circle, while a powerful new SOUL beginning is in the midst. These themes also connect with any area of life that you value, including areas of earning and creative expression, in essence, how you put yourself out there on the big stage of life. Life is a wild ride no matter how you slice it, and the full moon can often remind us of the twists and turns that life brings. The trends this week, although quite intense, also have a potently positive spin!